Chara antheridia from The Lizard, Cornwall UK was taken by longstanding BPS Member Chris Carter and Hilda Canter-Lund winner. Collected by Paul Gainey. This was one of the short-listed entries for The Times photographic competition in 2017 on the theme of ‘The Hidden World’. 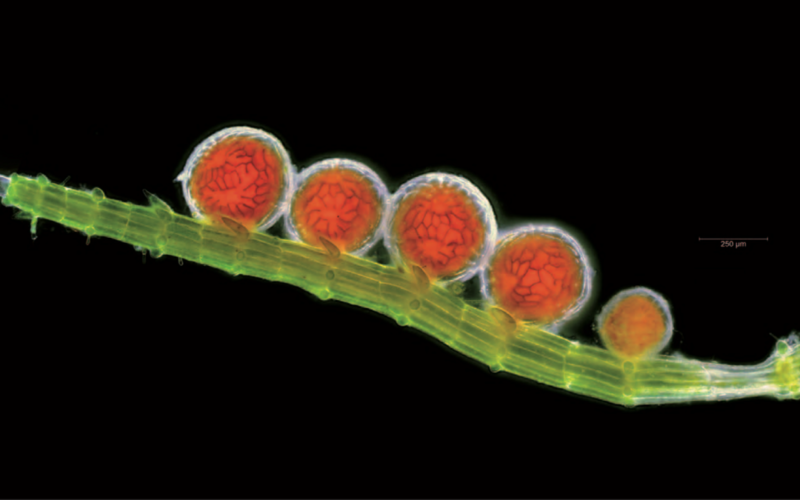 This is a line of antheridia on a male branch of the stonewort Chara fragifera, one of the algae. Each sphere has a closely-knit set of ‘shield cells’ with a black outline that give a dramatic setting to the red colouration. This Chara is rare (probably Cornwall only) in a few wetland areas and is not always fertile or in peak condition for photography. Even if found it would take some effort to see this and reveal the structure in a communicable way. In a short while the shield cell will burst open to release yet another hidden world inside:- tight coils of cells holding the motile antherzoids.